"May you rejoice in the wife of your youth...may you ever be captivated by her love." Love is NOT dead! I know it because I saw it with my own eyes! At first it didn't register. There I was, ringing out my groceries at the local supermarket, paying close attention to the climbing numbers on the screen in front of me. I was totally self-absorbed in what was going on with my own order until this man behind me set down two bundles of red roses on the belt behind my frozen chicken. 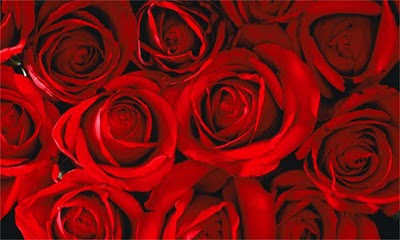 Instantly, my gaze was drawn away from my order to the beautiful, velvety, red petals of his bouquets. Then, before I could compliment their beauty or his thoughtfulness, my eyes spotted another bouquet further down the belt, and yet another, separated only by the white grocery dividers. Beyond the belt was a line of even more men holding the same bundles of red love closely to their hearts. What a sight! I'd never seen so many men holding so many roses for so many lovers at one time! My heart was encouraged to see their affection so freely displayed! Of course it's almost Valentine's Day... Hallmark's excuse to make money by guilting us into purchasing cards, flowers, candy and lingerie for that someone special... but, it was still nice to see them expressing their love in some way. As I bagged my groceries alongside my husband, (who had already presented me with my own bundle of roses... lucky for him), my mind wandered to the women who'd be receiving those ruby petals. Would they accept them with grace? Would they receive them as a token of that man's love? Would they thank him with a hug, a special smile, a kiss? Would they feel full of hope for their future? More simply, would they love him back? The verse I chose for today speaks of husbands rejoicing in their wives; being captivated by her forever. How does that happen especially today when over 47% of our marriages end in divorce? May I speak boldly, ladies? How we receive our husband's token of affection is as important as his offering of that gift. It's not the gift. It's not the delivery. It's the offer that's important. If our husbands love us so much to take the time to purchase us flowers, a gift, make a dinner or just offer us words from his heart then isn't it up to us to receive those tokens of his love graciously and affectionately? I love flowers! My husband knows that's the nicest gift he can give me. But, more importantly, I love the giver of that gift. I love that he still rejoices in me, the wife of his youth. I love that I still captivate his attention and affection after all these years...gray hair, wrinkles, cellulite and all!